Together, Dolly Parton and her book gifting organization have received honors and awards for their dedication to enriching the lives of children everywhere. 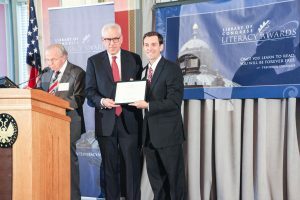 The Good Housekeeping Seal of Approval, Best Practices award from the Library of Congress Literacy Awards and recognition in Reading Psychology are among a few of the prestigious acknowledgments the program has received. 1995 – Entertainment icon and savvy businesswoman, Dolly Parton, founded the Imagination Library. She was inspired by her father’s inability to read or write. The program started as a local effort in Dolly’s home, Sevier County, Tennessee. In hopes of inspiring a love of reading and learning from a young age, the program mails one free, age-appropriate book to registered children each month. The first book order totaled 1,760 books. 2000 – A national replication effort began to expand the program’s reach beyond Sevier County, Tennessee. 2001 – Dolly Parton’s Imagination Library saw program expansion with 27 affiliates operating in 11 states across the nation. Local sponsors around the country came forward to support the program’s expansion, including Spartanburg, Sioux Falls and Sioux City, which seeded the program within their United Way organizations. These new communities mailed books to almost 30,000 children under the age of five, proving that dreams really do come true. 2002 – United Way organizations helped Imagination Library reach thousands of children in Native American communities throughout the US. Preschoolers in 92 Native American communities would become recipients of Imagination Library books. 2003 – The organization sent their one millionth free book! The milestone symbolized not only what had been accomplished so far, but also showed the promise of even more valuable opportunities for the future of Imagination Library. 2004 – Phil Bredesen, Governor of Tennessee, pledged to provide Dolly Parton’s Imagination Library program to every child under five across the entire state. For the first time, an entire state guaranteed that every child within its borders will have access to quality books and the joy they inspire. 2005 – An International Book Committee was formed to choose age-appropriate books for Imagination Library. With the help of Penguin Group USA, the newly formed committee selected the book titles to ensure every child received the best books possible. This move was the first step in transitioning into an international organization. Soon Imagination Library would extend into Canada followed by the United Kingdom and Australia. 2006 – Dolly bounced on a stage in Toronto to announce that the Imagination Library will now be available to children in Canadian communities. For the first time, the program crossed an international border with the goal to make the program Canada’s own unique attempt to instill a love for reading in all of her children. 2007 – In a special visit to London, Dolly announced that her Imagination Library would now be available to communities throughout the United Kingdom. In addition, Dolly’s Imagination Playhouse, featuring the Penguin Players, not only performed daily at Dollywood through the summer, it also brought the show on the road, performing over 70 times to over 4,000 kids. 2008 – Almost 5.5 million books were mailed and the total mailed since program inception soared to 17.1 million books! 2009 – In the United Kingdom, the 100,000th book was distributed, and in Canada the number of children participating each month increased by over 100%. Partnerships with Rotary International and United Way were announced in March and June respectively. 2010 – Dolly presented the 25 millionth Imagination Library book and by the end of the year the 30 millionth book had been mailed. 2011 – The Imagination Library announced a partnership with The American Printing House for the Blind. Audio versions of many of the Imagination Library books were created for children with visual impairments. 2012 – Following the success of the audio books, some Imagination Library books will be made available in Braille.Furthermore, the research article based on DPIL (by the extraordinary team from Le Moyne College) was accepted for publication in the journal, Reading Psychology. 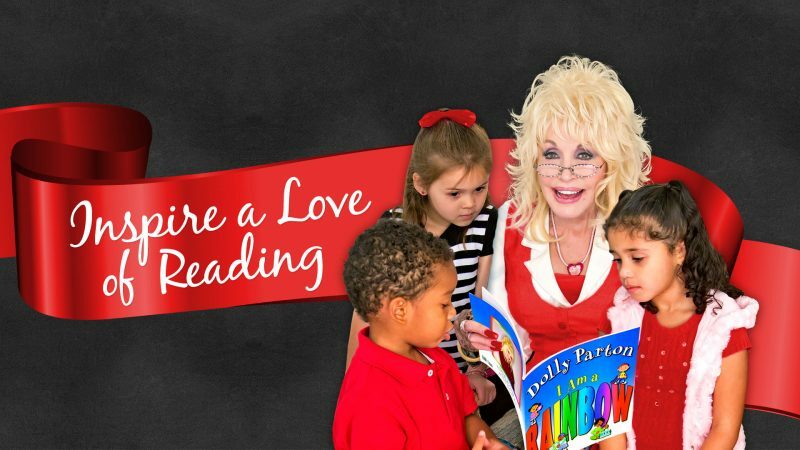 2013 – Dolly’s Imagination Library Expands To Australia after a partnership with the United Way led to a pilot effort with several communities which ultimately launched a national program. 2015 – The 20th anniversary culminated with a record-breaking performance that both extended and deepened the program across the world. The Book Selection Committee chose 12 bilingual Spanish titles for the USA and 10 new titles with more specific Canadian content. In addition, the pre-sales began for the Dolly Parton License Plate in Tennessee. 2016 – The program celebrated the “One Million A Month” milestone at Dolly’s sold-out concert benefiting the Imagination Library. In addition, a pilot program in Belize received over 19,000 Imagination Library books. Also, The Dolly Parton License Plate was approved for sales in Tennessee.